upgrade Craftsman 113 or save up for new saw? This is my first post on Lumber Jocks but i have been a long time reader. I am just getting more serious about wood working but will admit it is still a hobby. 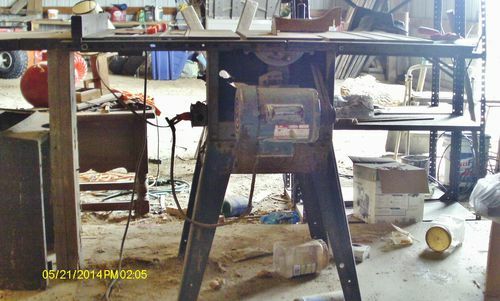 A number of years ago I received a table saw from my wife’s father (it is a 1970’s era Craftsman 113) with several upgrades (link belt, 220v motor, blade stabilizers, Craftsman router wing, and a stamped steel wing). The table saw is in overall good condition and I was able to polish the top with WD40 and steel wool and after that and paste wax wood slides over it easily enough. As a beginning wood worker I added a few additional upgrades (zero clearance insert with MJ splitter, and Grripper) at the advice of this board and others. Here is the question for the group. The aluminum wing for the router doesn’t fit my Bosch 1617 router, the fence is not great (but since this is the only table saw I have ever used I don’t have a frame of reference), etc. I have put together a plan to upgrade this saw, a Vega 50” utility fence system and a custom extension with Rockler Router plate that will allow me to mount my Bosch 1617 into the table. I estimate that the total cost of this will be somewhere around $500. Is the $500 investment worth it? Most say that with a proper fence the 113 is a capable saw, but it lacks modern any modern safety equipment (riving knife, blade guard, anti-kick back pawls). The fence upgrade will make an actual table saw out of that saw. You may not feel the need to replace the saw once the fence is replaced. I put a Delta T2 fence on a 113 best thing I ever did. I replace it later with a Sawstop but only because I wanted the Sawstop safety. What other tools do you have in your shop? I am basically in the same spot, but I opted to upgrade to the T3 fence and then work on acquiring other tools I’d like to get. My first saw was a 113, and I upgraded it with a 52” Biesemeyer and it would cut just about everything that I threw at it. I did a lot of casework, so I needed the 52” but honestly 36” would be good for most people. There will be a lot of naysayers, but do what’s best for you and your budget. Spend the money you save on other essential tools and wood. Thank you for the advice. That is the part that I am struggling with. As a beginning wood worker, saw stop’s technology is very attractive. The price is currently unattainable as it would probably be around $2000 for the saw that I would pick. What did you do with your old fence? Were you able to easily sell it to recoup some of your cost? What other tools do you have in your shop? I am basically in the same spot, but I opted to upgrade to the T3 fence and then work on acquiring other tools I d like to get. I do not have any milling equipment (jointer, planer, disc or stationary belt, etc.) nor do I have a drill press. I do have a fairly complete set of hand tools. The other tools I would like to add as the need arises is a drill press, and a bench top sander /w dust collection. I know that the cost of S4S is more expensive, but I do not have the storage / shop space to plane, joint, and store boards regularly. I will have to stick to smaller jobs and hobby projects for now. As for larger rip cuts than 36” you guys are probably right, I would be better of making it 1/4” ~ 1/2” proud and trim it to fit with a flush trim bit in my router. Just to confirm, my current saw without an upgraded fence would fetch $200 ~ $300? If that is true, i would assume that $300~$400 is reasonable if I were to complete the upgrades I am thinking about. With that logic and a downgrade to the less expensive Delta fence, I can likely complete my project for less than $400 and I will be able to recoup 1/2+ of that almost immediately and also pick up the ability to use a router table that I do not currently have. The sentimental value of the saw being passed down from my wife’s father, combined with the reduced hassle of not dealing with craigslist makes it seem to me that the Delta Fence upgrade is a wise investment. THanks for the tips and for talking me down from the Vega system. Clearwater. I have the same saw that you do but mine has none of your upgrades. Ive had mine for about a year and my only complain is that id love to add another extension so I could cut wider material. Your saw will serve you well as is without spending all the money. I’m sure your wife will appreciate it if you would keep it and you could possibly donate it to another family member when you out grow it. Check your saw on your local Craigslist and double check my estimate of what it’s worth, since my price range could be off in your area plus sometimes upgrades that aren’t that evident to the eye may not add value to some buyers. I understand the family connection thing, so if you have room and the funds go for a better saw with a better fence and use yours for a dado blade down the line. Trunnion on the original saw split…..replaced that, and a better motor….and added two more extensions to the right of the blade. Used that fence for the entire time…only “upgrade” was an add-on wood strip, for dados…a shim between it and the metal fence as needed, to keep the wood part straight…. Sold mine a few years back..only reason was I no longer had any room for this big of a tool.. I used that saw for almost 25 years (bought in about 1972) before I upgraded to a commercial grade cabinet saw. My biggest complaint about it was lack of power and the fence needed regular adjustments to keep it parallel to the blade. I build hundreds of projects with it and a Craftsman radial arm saw I also had. Lots of cabinets. My step son still has the saw and it still runs well with the original motor.. I use it when I visit and help this non woodworker with his projects. One of the reasons I did not replace the saw earlier was it’s portability. I worked in my garage and frequently needed to move it. Have you ever tried to move a large cabinet saw, even with wheels on it? I can’t recommend putting another $500 into that old saw except for possibly getting things that you could eventually move to a new saw when you think you are ready….like a good set of dado blades. The fence works OK but needs regular checking and adjustment. I would get a new (or used) router that fits this saw if that is a problem. You can never have too many routers (-: Or you may want to build a free standing router table? Safety equipment is great but the biggest safety item is setting on the top of your neck. Think safe and be safe. With the upgrades you have already, I don’t think you can buy a significantly better saw without upgrading to a cabinet saw. A new fence will make a world of difference. If the question were between this and a used Unisaw, I would say Unisaw. But between this and a $600-800 saw, I would say keep and upgrade. My advise is don’t do it. A1Jim is being nice ;-). Lets just say that era of ww’ing machines by Sears were not great. I owned one of those TS’s lin the pic above and also a bandsaw. They were both pretty awful machines. As you already know that fence is horrible but I wouldn’t spend 2x as much for a fence the whole machine is worth. My suggestion is keep an eye out for a used commercial grade saw. Or for for a little more money, something like the hybrid saw Grizzly carries. Guarantee it will be no comparision to what you’ve got. And BTW I see those old C’man saws all the time on CL their almost always $100 or less. 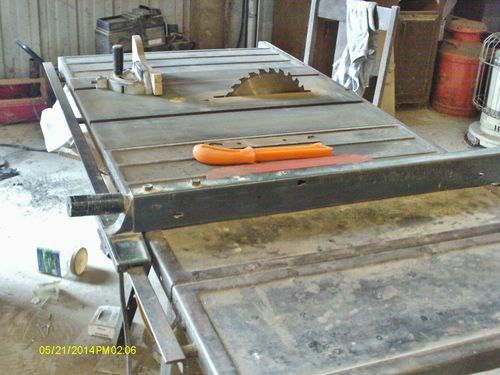 Yet another “Anti-Sears” biased diatribe….used my old saw for almost 30years..NO ISSUES. No kidding. Geeze, you would think some of these guys own stock in Craigslist, the way it always seems to be the go-to place for all of these “unicorn” deals on Unisaws, Grizzlies, and Sawstops. Where I’m from, there is hardly ever a “deal” on a used cabinet saw, but I can buy a Craftsman 113 anyday, six ways to Sunday. My point is this…..if you’re just starting out and you’re on a budget, you gotta go with what you have.In the past, I’ve built several built-ins using a well-worn Hitachi jobsite saw and they’ve come out just fine. In fact, I still use the thing in combination with my track-saw out on the jobsite. 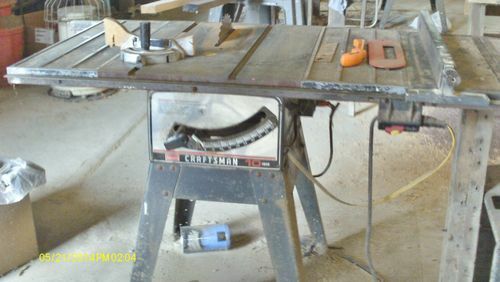 I was given a Craftsman 113 saw— that was my first table saw. I mounted a Delta T2 on it, aligned with a PALS kit, put on a link belt, and used that saw regularly for 7 years. I recently got a 12” Craftsman Motorized Table Saw, so I relocated the T2 to the newer-to-me saw. I think you’ve gotten some pretty good advice here, but it’s your decision ultimately.